Parents for Public Schools of San Francisco is widely known for our expertise in public school enrollment. But we do so much more! Our diverse and knowledgeable organization offers workshops for parents to become engaged leaders in their school communities. We offer sixteen workshops that are well-researched and easy to understand. We break down complicated issues, such as school budgets and school district governance, into accessible presentations that are excellent fits for PTA or School Site Council meetings. We can present in English, Spanish, Cantonese, and/or Mandarin. 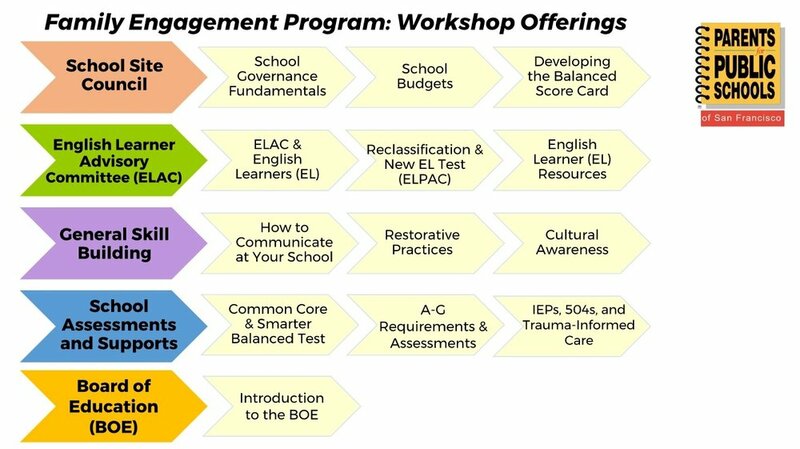 Our Family Engagement Workshops tend to last between 30 minutes and one hour, and can be tailored to suit the needs of your school or organization. Financial assistance is available for qualified schools and programs. If you would like to learn more or to invite PPS-SF to speak on one of these topics, please email info@ppssf.org.